2-Sided, weatherproof. Includes one 24" mounting bracket made of black steel, inserted between the corrugated openings. Sign states "HOUSE FOR SALE". 2-Sided, weatherproof. Includes one 24" mounting bracket made of black steel, inserted between the corrugated openings. Sign states "FOR SALE BY OWNER". 2-Sided, weatherproof. Includes one 24" mounting bracket made of black steel, inserted between the corrugated openings. Sign states "OPEN HOUSE". 2-Sided, weatherproof. Includes one 24" mounting bracket made of black steel, inserted between the corrugated openings. Sign states "GARAGE SALE". 2-Sided, weatherproof. Includes one 24" mounting bracket made of black steel, inserted between the corrugated openings. Sign states "FOR RENT". 2-Sided, weather-resistant sign. Bold lettering maximizes visibility. Individually polybagged with one 24" steel mounting bracket. Mounting bracket inserts between corrugated openings. "MAKE-IT-YOUR SELF SIGN"
2-Sided, weatherproof. Includes one 24" mounting bracket made of black steel, inserted between the corrugated openings. Sign states "YARD SALE". 2-Sided, weatherproof. Includes one 24" mounting bracket made of black steel, inserted between the corrugated openings. Sign states "GARAGE SALE". 2-Sided, weatherproof. Includes one 24" mounting bracket made of black steel, inserted between the corrugated openings. Sign states "FOR RENT". 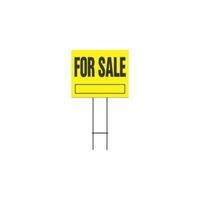 Red, yellow, black, and white decorative sign, which states "FOR SALE BY OWNER." Has sharpsales.com listing option. 4mm corrugated plastic. Weather resistant. Double-sided, bold lettering maximizes visibility. Sign comes attached to frame; no installation necessary. Red background with white lettering. Sign states "FOR RENT". Weather resistant. Double-sided, bold lettering maximizes visibility. Sign comes attached to frame; no installation necessary. Red background with white lettering. Sign states "FOR SALE BY OWNER". Steel frame. Heavy-duty number plate. Vinyl, self-adhesive numbers.